Multifunction led table lamp with USB socket, alarm clock and thermometer. Folding arm. For any information, contact customer service. 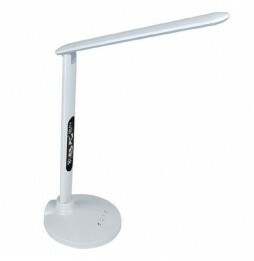 Portable led table lamp with folding arm and adjustable led. Alarm clock with calendar and thermometer included. For any information, contact customer service. Portable LED table lamp with multicolored base with ambient light. Adjustable LED with flexible arm. Internal rechargeable battery. For any information, contact customer service. LED table lamp with flexible arm and multicolored light. Multifunctional with USB socket for charging smartphones and tablets. Touch controls and plug-in power supply. For any information, contact customer service. LED lamp with selectable color temperature (warm light / cold light / natural light) Digital display for calendar display, time, internal temperature (in ° C and ° F) Touch controls 5 levels of brightness adjustment Adjustable flexible arm Alarm with alarm Snooze function Clock 12H / 24H format Calendar Double USB 2.1 / 1.0 A socket for charging Smartphone. LED lamp with selectable color temperature (cold light / warm light / natural light) Digital display for calendar, time, date and internal temperature display (in ° C) Touch controls 5 levels of brightness adjustment Adjustable folding arm Revolving stem Alarm with alarm Clock 12Hr / 24Hr format Calendar 5V - 500mA USB socket for Smartphone charging. LED table lamp with flexible silicone arm. Dual USB socket for charging your smartphone or tablet. Selectable color temperature (cold light / warm light / natural light). Touch controls. For any information, contact customer service.